On this day in 1973 the great Secretariat put on one of the greatest athletic performances of all times. 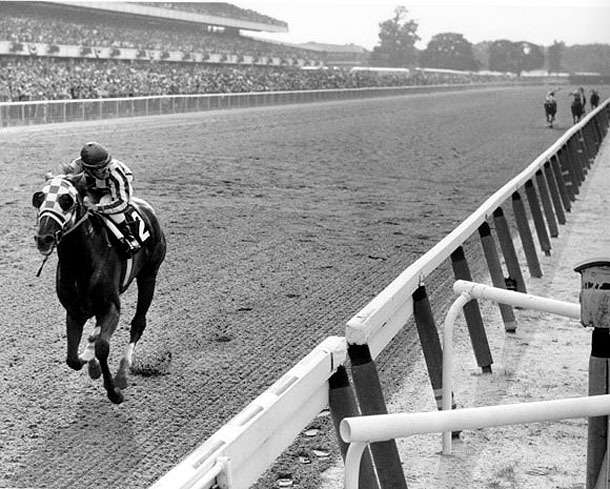 Secretariat won the third leg of the Triple Crown, The Belmont Stakes by an incredible 31 lengths. In doing so he also set the record not only in The Belmont Stakes for the fastest time ever but it is also the fastest time ever for a horse on a 1 1/2 mile dirt track. Secretariat’s times in all 3 of the Triple Crown races still stand today as the records. Secretariat became the first horse in 25 years to win the Triple Crown. The only other individual athletic performance I’ve ever seen that I’d rank up there with Secretariat’s Belmont Stakes run is Bob Beamon when he broke the long jump record at the 1968 Mexico City Olympics. Secretariat ran so fast and was pulling away so early in this race some thought not only can he not keep this pace up but he’s going to kill himself he’s running so fast.